She made this comment from Paris, where she was taking part in two high-profile shows for designers Emmanuel Ungaro and Giambattista Valli. Although no details have emerged regarding any incidents that could have potentially taken place, it is likely that there was no dramatic fallout or huge outburst. Chances are that Dunn simply had enough of the lack of concern given to making sure that a woman of her color and with hair that has a dramatically different texture than that of her white counterparts was provided with someone capable of doing it. As more models of color make their way to magazines, billboards and runways, one issue that has not been resolved is how to make sure these women have natural hairstylists and makeup artists that are knowledgeable about textures and tones. It seems that, regardless of how diverse the models become, there is a lack of diversity in the people paid to make the models up. The fashion industry has received a number of critiques about how it's run, who it includes, what it represents to our society and how it affects the ways women perceive themselves. Similarly, the world of fashion has responded in kind, taking notes from the concerned mainstream and making tiny changes here and there to reflect the real world. Rail-thin, often-starving models have given way to a few plus-size starlets, and the diversity among models has grown to include women of all colors. Recently, Ford Models even put out a promotional ad that sought to highlight their diversity by featuring only black models, making the days where Tyra Banks and Naomi Campbell were the only black models a thing of the past. 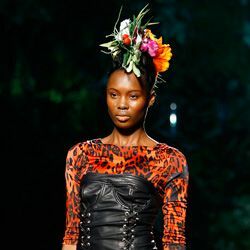 A study performed by Loop21 provided data showing that diversity was on the rise in fashion, specifically during fashion week in New York where over 200 runway shows featured models of African descent. There were only a few designers that had shows that were completely devoid of any models of color, or varying ethnic backgrounds, and featured only white models. Slowly but surely the fashion industry is changing. But the bigger question surrounding this issue of diversity is how to make sure that black women and other women of color are given the same care, attention and precision that white models are given when it comes to perfecting their hair and makeup. In addition to the need for increased diversity among models, another focus should be put on the need for natural hairstylists and make-up artists that are knowledgeable of different hair types and textures, capable of recognizing the subtleties of various skin tones and respectful of the need for the diversity behind the scenes, as well as in the spotlight. Diversity is not merely a showcasing of different types of people, but the embracing all of cultures and colors. The fashion industry may be hiring more and more diverse models, but until they begin to hire makeup artists and natural stylists who are experts in the fields related to those diverse women, we cannot truly say the playing field is level. Read all about Corinne Bailey Rae's natural hair attitude in our one-on-one exclusive interview! What do you think about Jourdan's tweet, and how the fashion industry can attract more natural hair stylists?